All Day Chemist is a pharmacy that operates on the web but has its physical location in India. This pharmacy was founded in the year 2002. The drugstore has been selling generic medications from different companies around the globe. This pharmacy offers a wide range of medications. Some of the medications you can source from the drugstore include Anti-cancer, Anti-coagulants, Asthma meds, hair loss meds, herbal meds, joint health medications, and more. This pharmacy only stocks medications that have been approved by the FDA. I managed to locate both over the counter medications and prescription meds on the pharmacy. Alldaychemist.com had erectile dysfunction medications. All the medications available were generic meds. I checked the price of one of their generic Cialis brands. The generic brand is known as Tadacip which is manufactured in India by a pharmaceutical company known as Cipla. The highest price you will have to pay for a pill of the medications is $3.10. The pharmacy accepted a variety of payment methods. These include check or money orders, eCheck for United States customers only and Wire Transfer for big transactions that exceeded 1000 dollars. The pharmacy also accepted credit cards as a payment method. The credit cards you can use at Alldaychemist.com include Mastercard, VISA, and American Express. Although this drugstore was not very clear about the shipping methods they use, the pharmacy did indicate that the shipping usually takes about 2 to 3 business weeks. The drugstore also did not offer an explanation on the shipping charges a buyer should expect. 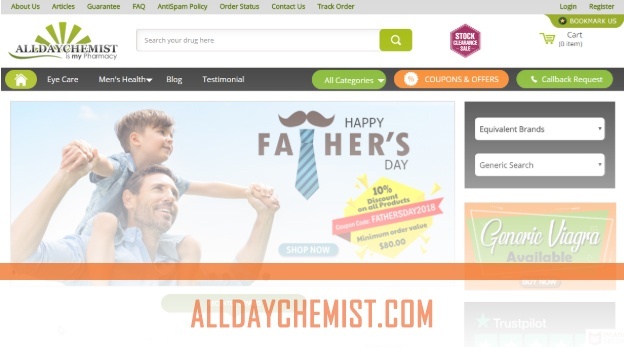 Alldaychemist.com indicates that they will reship your products if they get returned to the pharmacy. The pharmacy indicates that their aim is to offer their customers 100% satisfaction. They indicate that if your package got destroyed during transit, they will either refund you or reship another package. The drugstore indicated that their customers would have to allow at least 30 days pass before the refund or the reshipment process is initiated. The pharmacy also had a contact page where all its contact details were included. The drugstore had 4 phone numbers. These include +1 855 840 0584 (toll-free United States), +442075721246, (UK), +61290380439 (Australia), +1 213 291-2588 (international callers). The pharmacy had a fax number which is +1 760 284 5903. For people who preferred to send an email, you can use the contact page form integration to open a ticket. The above review from Franck shows a satisfied customer. 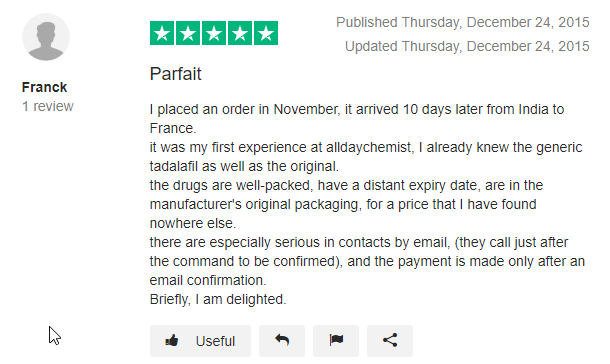 The man says that he placed his order at Alldaychemist.com and it only took 10 days to arrive. He already knew the generic tadalafil would be as good as the original. The medication arrived well packaged. The price that he paid for the medication was great. The pharmacy kept in touch with him and even called to confirm the order. The payment is only made after an email confirmation. Franck says that he is delighted. 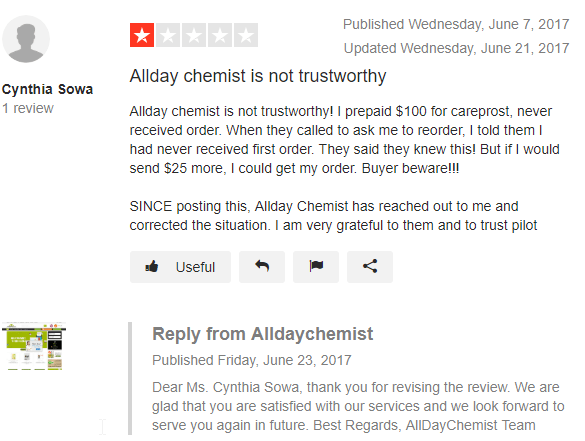 Cynthia who was initially angry with Alldaychemist.com for not sending her Careprost order to her revised her comment. She indicated that since her first review, the pharmacy reached out to her and made things right. They sent her order to her. She says that she is grateful for the pharmacy. Paul says that the products he got from All Day Chemist are of great quality. The shipping was discreet and he was able to receive the products within a period of 2 weeks. He says that he has no complaints. Even the representative he talked to was very kind to him. 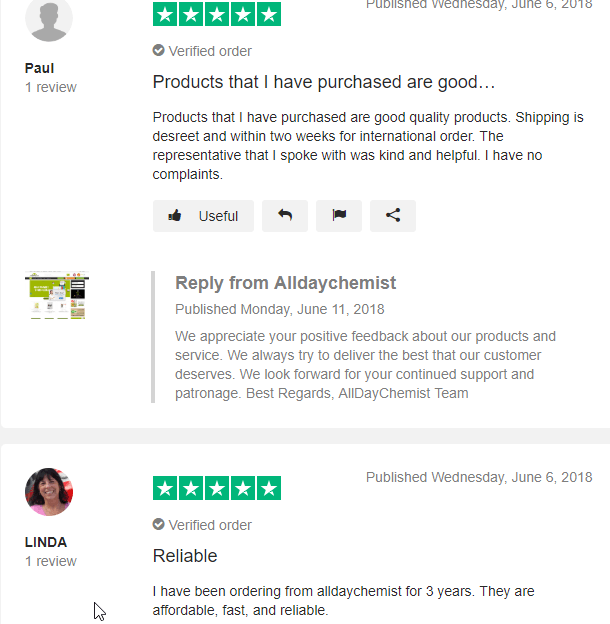 Linda has been sourcing all her medications from Alldaychemist for the past 3 years. She reports that the pharmacy is fast, reliable, and affordable. The reviews available online for All Day Chemist indicate that the drugstore can be trusted. This means that as a buyer, you will be safe when sourcing your meds from the store. The pharmacy even takes care of reaching out to unhappy clients and making things right. The first coupon code will allow you as the buyer to save 15% on your medications. 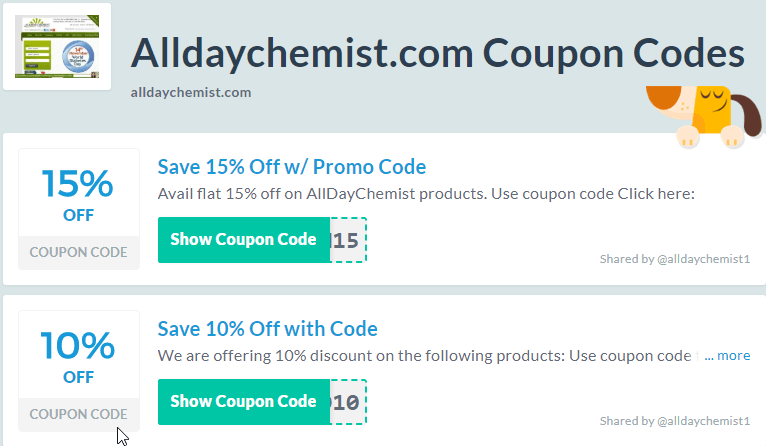 The second coupon code will allow the user to save 10% on all his or her medications. The coupon codes are supposed to be used by the buyer at checkout. The fact that this All Day Chemist has over 85% of its reviews being positive shows that the drugstore can be trusted. The pharmacy only requires prescription scripts for prescription medications. 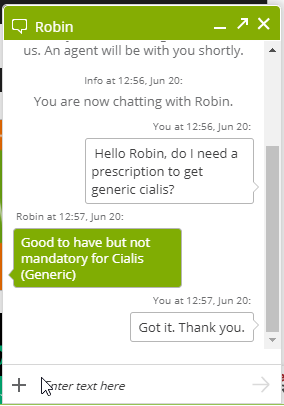 The drugstore has a very dedicated customer support department. I tried chatting with one of their agents using the live chat option and got an immediate reply. One thing I would like an improvement on is how the drugstore organizes its medications. It was a little bit hard for me to locate some of the medications.